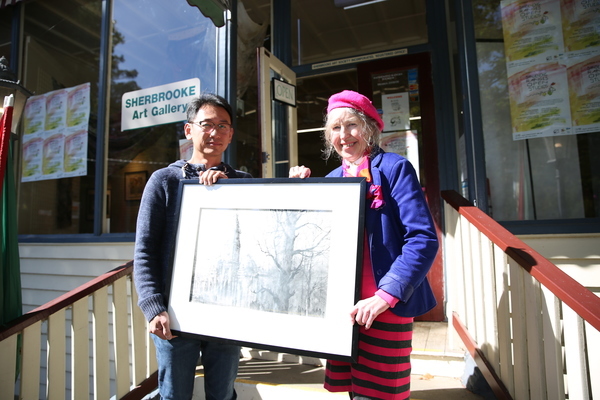 From left; It Hao Pheh and president of the Sherbrooke Arts Society, Eve Clemence invite people to apply for the Streeton Roberts Mc Cubbin awards exhibition. Principal Art Gallery Sherbrooke Gallery has announced that the Streeton Roberts McCubbin Exhibition will be held Friday 3 May through to Sunday 26 May. The exhibition is one of the longest continuous annual art events in the Dandenong Ranges region, and consists of, over 70 artists exhibiting over 140 works of art utilising a range of mediums including; oils, acrylic, pastels and watercolour. Held in high-esteem by both the local and wider community, the exhibition boasts hundreds of visitors each year, with the number of visitors continually growing. Amongst these prizes are the, Sir Arthur Streeton Award for Best Landscape, the Tom Roberts Award for Best Non-Landscape and the Frederick McCubbin Award for Best Small Painting. Winning a Streeton, Roberts or McCubbin Award is considered a prestigious addition to the CV of any artist. This Free event will be held at Sherbrooke Art Society’s Gallery located at 62 Monbulk Road in Belgrave Victoria.